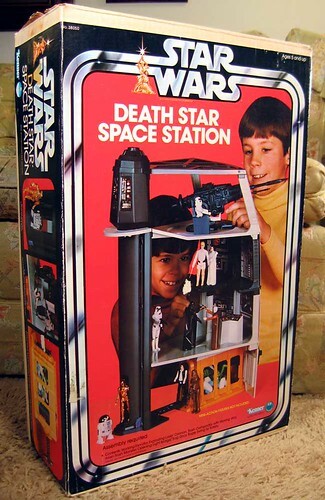 Back in 1978, this was without question my single favorite toy of all time, and in my opinion the greatest of the Kenner Star Wars toys back in the day. A given it’s pure awesomeness it in many ways remains one of my boyhood toys closest to my heart. The trash compactor filled with foam, and trash monster was without question magic. I could go on for a long time about this toy, but while searching for the commercial (embedded below) I came across a very thorough review that takes you through the whole toy rather comprehensively, and goes a long way to prove just how amazing the web is—and how joyfully willing people are to share their obsessions. This entry was posted in 1102xmaS and tagged 1102xmaS, Death Star Space Station, star wars, toys. Bookmark the permalink. I was at my parents’ house this weekend and dug through every single storage area I could find in hopes of locating my Star Wars collection to turn over to my three year old son. I had the Death Star, an X Wing, the Falcon, a Tie Fighter, and even Luke’s Land Speeder. 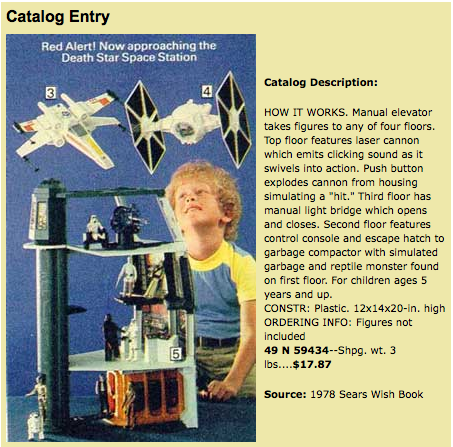 What blows my mind (along with the play)is how much cheaper it all was then … and even accounting for 1978 prices, the Star Wars stuff of today is just out of control expensive. I was looking at getting my boy some stuff for Christmas and an X Wing is now over $100.00. Crazy. I had this one as well! When my nephew was old enough, and also obsessed with SW, I passed it on to him……along with the rest of my SW toys! In fact, this whole series is about just that, a reminder of things gone by. I live for that. I dig the fact that you are making up for it now. And if I had my head about me I would have preserved a lot more of the Star Wars stuff than I did, but then again that is the joy of nostalgia—desiring something you really can’t have again. And I always found the having of it was not nearly as rewarding as the desire. Things are strange that way.